In this post I try something new: I will keep it short. This is actually an update long overdue. Months ago I have written a post on how to control the four elements that is how to harvest energy from ambient air, solar radiation, the freezing of water, and ground here. A loyal reader told me that they tried to figure out how our heat pump system works – based on our German blog. Actually, at that time we mainly posted about the aesthetic value of our solar collector and re-using it as an espalier for tomatoes. Nevertheless, since the most recent layout update of our website, it bothers the perfectionist in me that all our technical documents on heat pumps have been only available in German. So I started to translate them. The first one is a summary / ‘folder’ / overview. Theoretically this should be self-explanatory. The person who has actually created this figure is best described by his tagline: Somebody Doing Anything Nobody Wants to Do. He is a shy engineer spending nearly all this time in his Doc-Emmett-Brown-style inventor’s garage so I cannot link to any English social media profile. Oh wait – except this one… sort of. I had to consider the global context when stating that no permits are required (in Austria). This is an insider joke probably only comprehensible to Austrian readers: If there is a worst-case scenario in terms of permits required and bureaucracy in general, it is probably Austria. As we say: Bill Gates would probably not have founded Microsoft here as he couldn’t get the required forms filled out correctly. This is the second time my different blog universes cross – and it is very exciting: as the team of Gray’s Anatomy meeting Private Practice. Yes, I do watch TV – I don’t read deep science and philosophy books every evening. The first cross-over occurred when I discussed in German if and how our system would work in Canada in a post that translates to Canadian Challenge … which was actually a rehash of my answers to the comments in the very first blog post in the four elements. I think I will indulge in that type of cross-overs more often! 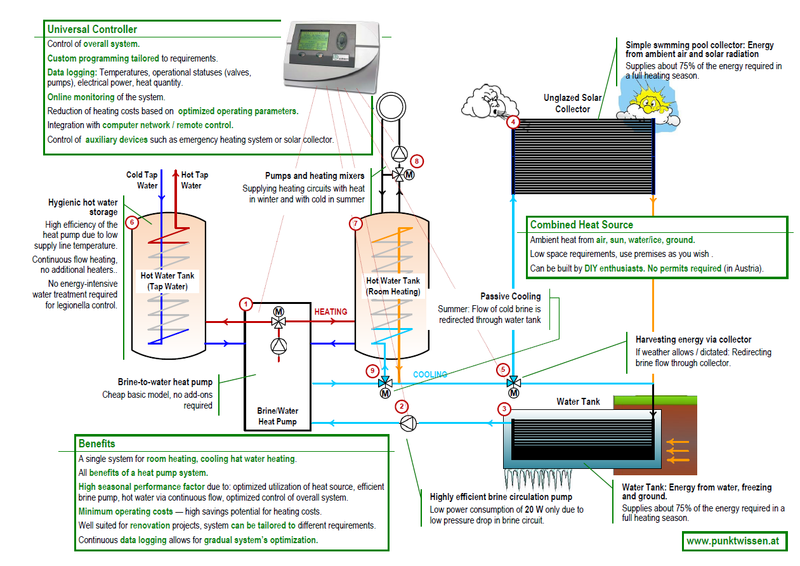 This entry was posted in Heat Pump, punktwissen, Science and Technology and tagged Energy, Engineering, Geek, Heat Pump, Heating, Renewable Energy, Solar Collector, Solar Energy, Technology by elkement. Bookmark the permalink. Thanks, Mike! Actually, I browsed my own posts recently and figured it might not be obvious at all what I do for a living 😉 But starting with the previous post (on IT security) I feel like writing more posts related to my work in some sense. Glazed solar collectors and log burners and are popular here, too – and pellet furnaces. A lot of research has been done in Austria on how to make smaller regions or communities “energy-autonomous”, based on a combination of burning (or gasifying) biomass from the surrounding woods and other renewable sources. It just works for small communities with impressive areas of forest though. What! Elkement watches mainstream TV…and shows from the US even! I have to confess I watch some too. There’s a time to make the brain grow and a time to just sit back and let it all just do some latent activity and nothing inspires latency like TV. Like many I’m particularly looking forward to the resumption of “Game of Thrones.” There’s a relatively new show on SyFy that I’ve been watching called “Helix.” Though supposedly somewhat scientific, as is often the case, they sacrifice realism just to make the story interesting but, in the end, I don’t really care – I watch to be entertained, not educated. Watching US shows is the mainstream thing to do here: Even the (former monopolist) “governmental” broadcaster – the one with the educational agenda, who collects impressive fees because of that agenda – has lots of US shows at primetime (dubbed versions). I am even a rather lazy TV consumer and consume what the broadcasters dish. Except from the Star Trek episodes I have on Blu-ray. Cool – I’ll have to tell him to check it out. He’s been a “silent reader” in my blogging absence, keeping current with everyone. 🙂 Dave’s post on water wells also caught his attention recently, and he was quite excited to give me full updates and stat reports. I started my first week of being self-employed (again!) working on the next draft of the book and giving the house a good cleaning. I am so very aware of the back-log of good reading stashed away behind everyone’s home pages, and can’t wait to dig into it! Thanks, glad you like it! I have now also added a feed to the English version of our website (http://punktwissen.at/en/) so that I can announce future updates on documents I have translated. Enjoy your freedom now 🙂 and don’t feel obliged to follow up on all my walls of text 😉 It seems my writing gravitates towards professional stuff now – so I might blog more about IT security, heat pumps and some general aspects of business.